University of Chicago Press, 9780226076904, 306pp. As anyone who has flown into Los Angeles at dusk or Houston at midday knows, urban areas today defy traditional notions of what a city is. Our old definitions of urban, suburban, and rural fail to capture the complexity of these vast regions with their superhighways, subdivisions, industrial areas, office parks, and resort areas pushing far out into the countryside. Detractors call it sprawl and assert that it is economically inefficient, socially inequitable, environmentally irresponsible, and aesthetically ugly. Robert Bruegmann calls it a logical consequence of economic growth and the democratization of society, with benefits that urban planners have failed to recognize. In his incisive history of the expanded city, Bruegmann overturns every assumption we have about sprawl. Taking a long view of urban development, he demonstrates that sprawl is neither recent nor particularly American but as old as cities themselves, just as characteristic of ancient Rome and eighteenth-century Paris as it is of Atlanta or Los Angeles. Nor is sprawl the disaster claimed by many contemporary observers. Although sprawl, like any settlement pattern, has undoubtedly produced problems that must be addressed, it has also provided millions of people with the kinds of mobility, privacy, and choice that were once the exclusive prerogatives of the rich and powerful. The first major book to strip urban sprawl of its pejorative connotations, Sprawl offers a completely new vision of the city and its growth. Bruegmann leads readers to the powerful conclusion that "in its immense complexity and constant change, the city-whether dense and concentrated at its core, looser and more sprawling in suburbia, or in the vast tracts of exurban penumbra that extend dozens, even hundreds, of miles-is the grandest and most marvelous work of mankind." Robert Bruegmann is chair of and professor in the Department of Art History at the University of Illinois at Chicago as well as professor in the School of Architecture and the Program in Urban Planning. His many books include The Architects and the City: Holabird & Roche of Chicago, 1880-1918, also published by the University of Chicago Press. "Largely missing from this debate [over sprawl] has been a sound and reasoned history of this pattern of living. 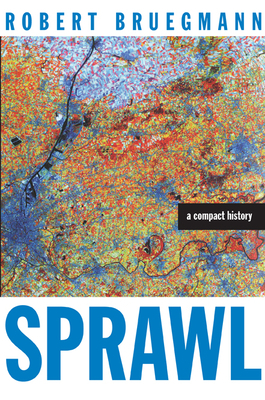 With Robert Bruegmann's Sprawl: A Compact History, we now have one. What a pleasure it is: well-written, accessible and eager to challenge the current cant about sprawl." "Sure to become a flash point in the debate over sprawl and is therefore well worth reading--even if the book tempts you to toss it out the window." "If you have not read Sprawl: A Compact History, drop everything, obtain a copy and read it. It is the most important book on the American landscape since Jane Jacobs' The Death and Life of Great American Cities. Do not be deceived. Sprawl is as much about cities as it is about suburbs; as much about England, France, Germany, and Russia as it is about the United States; and as much about the early 21st century exurb as it is about 19th century slums or ancient Rome. It succeeds as a deeply illuminating work because of Robert Bruegmann's unique position among urbanists: He combines an insistence on looking at what is actually on the landscape with an encyclopedic knowledge with the literature on cities. The result is a keen observer able to identify striking relationships. . . . . You may think you know this material. Be assured--once you read this book you will be amazed how little you truly understood about the subject." "This is a book that a geographer should have written. Scholarly, yet accessible to a wide audience, it treats an important subject that is both controversial and inherently spatial. . . . Subtle and well-informed, [Sprawl] mounts a sustained critique of a set of assumptions and arguments that dominate public and academic debate. For anyone with an interest in, or a practical engagement with, urban development issues, Sprawl is indispensable reading." "By asking tough questions, postulating rational responses, and trying to separate fact from fiction, Sprawl may be the most intelligent critique of antisprawl reform in print. It is unquestionably a book to be read and debated." "[Sprawl] is a very good and timely book, and I recommend it to anyone interested in cities or general patterns of human settlement. The book is meticulously researched, ambitious in historic scope, well reasoned, and enjoyable to read. It offers a carefully balanced, non-polemical overview of a subject much polemicized in recent times." "The clarity of writing . . . makes the book a pleasure to read. [Bruegmann] is tough on ecologists, public trnsportation supporters, planners . . . critics of capitalism, and anyone who cannot accept that suburbs are where most people want to live."